Sometimes, when we ask questions, we need to be prepared for the answers. Once there was a rich young man who asked Jesus what he had to do to inherit eternal life. The answer Jesus gave him was not something he wanted to hear. The man went away dejected. Then there are those times when others ask questions of us. It would be helpful to understand what they are truly asking. 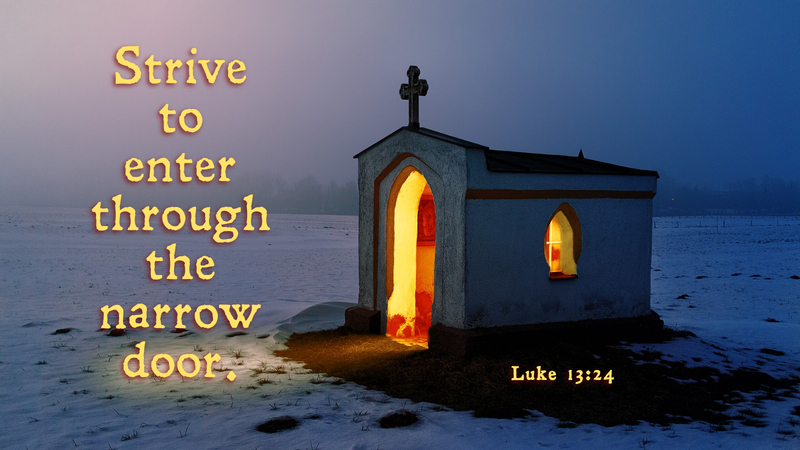 For those who strive to enter the kingdom through the narrow door, there is no need to ask. Jesus tells us the truth and he shows us the way. Those who believe and are baptized will be saved (Mark 16:16). Will it be few? Will it be many? It isn’t up to us to answer. Ours is to take Jesus at his word, to tell others about God’s saving grace and live as reflections of his love. Prayer: O Lord, help me walk in your ways, that my life would reflect your love. Amen. This entry was posted in Lent and tagged Christian, Christianity, Eternal Life, Faith, First will be last, Grace, Jesus, Jesus Christ, Kingdom of God, Salvation, Spirituality. Bookmark the permalink.